“Is there anything new in the search for your natural father?” people often inquire. Or, they ask me why I haven’t written about it lately. The answer was that there hadn't been anything new for quite a while. But suddenly now...there is! My search is freshly invigorated with hot new leads thanks to one of my sisters at Lost Daughters who has not only put her own investigative talents to use, but has introduced me to two individuals who have readily agreed to help. One specializes in working with surnames and the other is a professor and genealogist with expertise in DNA. I am totally amazed at connections they have already found. I am thankful to also have the same three people who have been working on my search all along, and are still there for whatever is needed. I accomplished the search for my natural mother alone, without knowing what I was doing at all until I got into it. The search for my natural father is much more complicated as it’s almost entirely DNA based. It's taking a village! Interestingly enough something I’ve found as I’ve gone along in my search through DNA is that there is a lot of adoption in my background. We have found quite a number of adoptees in my age group, who are cousins. One woman who is my cousin is just two years younger than me, and was adopted from the same agency I was in Richmond, Virginia! And then there’s a man who is a bit younger than both of us, my cousin, also adopted from Richmond, VA through a Methodist maternity home. (Interestingly my maternal family are Methodists.) These are just two adoptee family members I’ve “met” online this past month that I’ve discovered through DNA. My family on one or possibly both sides were definitely active participants in the Baby Scoop Era! DNA searching has proven: my family was addicted to adoption. The good news is, we’ve discovered these cousins. The bad news is, being adopted we all have no idea where we fit in. All of us are searching for the same answer. How do we intersect? We’re not sure yet. I have a feeling the professor will help us unlock the answers. DNA testing is exploding not only among adoptees but non-adoptees. It’s become a cool gift to give, to anyone. How awesome is it, to know the percentage of your heritage? To know just how Greek or Korean or British you are? I’ve been advised, in a few months, my matches will greatly increase just from the results arriving from the plethora of people who received a DNA test for Christmas. Who would have thought just a few years ago that this would have been so? I have tested at Ancestry, 23 andMe, FTDNA and GedMatch – so my matches are plentiful. But most are distant. We pray for closer matches than what we are getting. I wish everyone in the world would test their DNA. It's not expensive. It's something valuable and interesting for each person to have, and it helps adoptees who are searching, more than anyone would ever realize! In fact, if literally everyone out there tested, it would bring secrets to a screeching halt! How incredible would that be? It has been recommended that one of my sons do a DNA test to give us more information with which to work, to rule out matches to the paternal or maternal side. 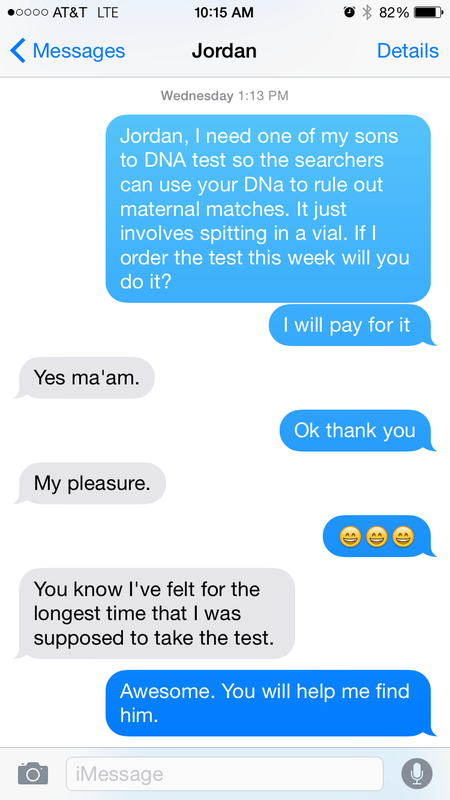 Many people have asked why I don’t have my maternal birth family DNA test. I do not have anyone in my maternal birth family who is willing to, out of loyalty to my mother. Yes, loyalty goes even to the grave. I guess that’s good if you’re talking about something good. But when it means being loyal to a family secret that should have never been a secret and violates someone’s human rights…well, no... it’s not good. Shame is so ugly. And that’s all I have to say about that. For now. My son Jordan is going to test. It will take longer doing it this way than having one of my maternal relatives take the test, but it’s not the first time I’ve had to take the long way home. Even when you take the long way home, you still get there.